Every diver knows it’s important to keep a log of all scuba dives! My early logs are on paper, but here are some of my most recent dives since 2014 in Mexico and the South Pacific. We planned to dive at the apron, but when the outboard motor had issues on the way to the dive we decided it would be safer to flood in on the incoming current of the pass instead of going outside the atoll. The current was light and sharkies were few. I got two excellent videos of a large titan triggerfish feeding on coral. What a great scene to shoot in low current! These fishes are active subjects, who break off big pieces of coral looking for food. An entourage of smaller fishes surround the large Triggerfish, hoping for a scrap as he roots around in the reef. We went diving at the dream site, and instead of finding the normal sand hallway we kept swimming far past it, and eventualy ended up on a coral plain at around 65 feet. It wasn’t the prettiest place, but then we saw a huge turtle feeding on green moss on the sea floor. We approached within five feet. The turtle continued eating and never showed signs of fleeing. What a beautiful and trusting creature! It was a memorable encounter, and I got an excellent short video of the turtle feeding. Flooded into the pass from the outer wall. I especially love the long, white sand section leading into the pass. Sometimes I could see the sand fluttering around in the strong current, and it’s easy to imagine how this area is scoured with the strong incoming floods. Excellent video of schooling sharks and coral at the beginning of the dive. It’s always very sharky at the start. 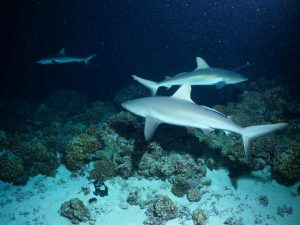 7/6/2018 – 5:30 PM Fakarava South Pass, 45 feet, 32 minutes – First night dive with sharks! We stayed near the starting buoy so we could dive with the sharks outside of the current. It was extremely exciting. I wrote a blog post all about it. 7/7/2018 – 10 AM Fakarava Apron, 82 feet, 42 minutes – Flooded into the pass from the outer wall. Brian had the camera and got an excellent video of me petting a shark! I met a divemaster who enjoys petting sharks sometimes and showed me a video of a shark tolerating it. But this shark did not seem to like it and swam away after I gently caressed its tail. It felt great to swim without my camera, and simply be a diver instead of a videographer today. I enjoyed the life around me instead of shooting a lot of videos like I usually do. We saw a giant manta ray flying at the edge of visibility in the south pass. What an incredible sight! 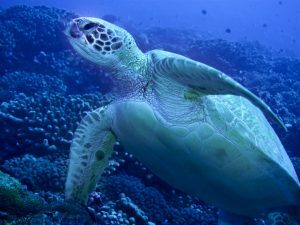 A divemaster told me they are never seen at Fakarava’s south pass, only at the north pass. I think this was a very unusual sighting and it was super exciting to see it cruising down the pass. 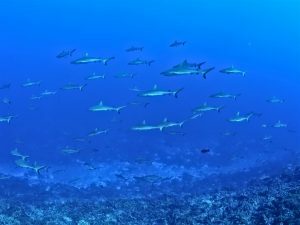 7/8/2018 – 10 AM Fakarava Apron, 89 feet, 42 minutes – Best wide angle video yet of the shark aggregation in the pass. Conditions were clear and beautiful, and I have truly lost my fear of these peaceful sharks. I swam a few feet away from them, surrounded on all sides by Gray Reef Sharks, as long as I am. They allowed me to join them and get close up videos of at least 200 swimming into the current all around me. Wow! I also got a nice wide angle video of an eagle ray, but I feel the other lens (medium, or lemmy lens) captures the beauty of the eagle rays better. When showing the vast number of sharks in the pass, the wide angle lens is best! Soooo many sharks today! 7/9 – 10:30 AM Fakarava Apron, 72 feet, 49 minutes – Brian had the camera today, and we drifted on a strong current over the apron and into the pass. We drifted through the entire pass. A great dive. The first time for me to try swimming for a wide angle video in the shark aggregation while Brian films me with the GH5. Trying to be graceful and swim smoothly through hundreds of sharks, without my camera between myself and them, my face just a few feet from thiers. Some of them flee from me as I approach them, none respond with any aggression. A nice video of me close to the sharks will be a great addition to my documentary. I want to show how the sharks respond to me as I swim near them. 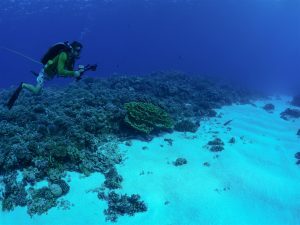 7/10/2018 – Fakarava South Pass 11:30 AM 75 feet, 32 minutes – Brian had the camera and shot videos of me swimming with the sharks, this time with a wide angle lens. I love these animals! This is a tough shot to get, and we still may need to try again to get everything just right. The best is when Brian is in front of me, with sharks between us, and I swim toward him. 7/10/2018 – Fakarava South Pass 12:15 PM 45 feet, 39 minutes – Shallow second dive, since the current was so strong our prior dive was a little short. Brian had the camera with the wide angle lens and shot videos of eagle rays, sharks, and me swimming with the shark aggregation. Saw a huge school of Fusiler filling the entire pass! Beautiful sight! 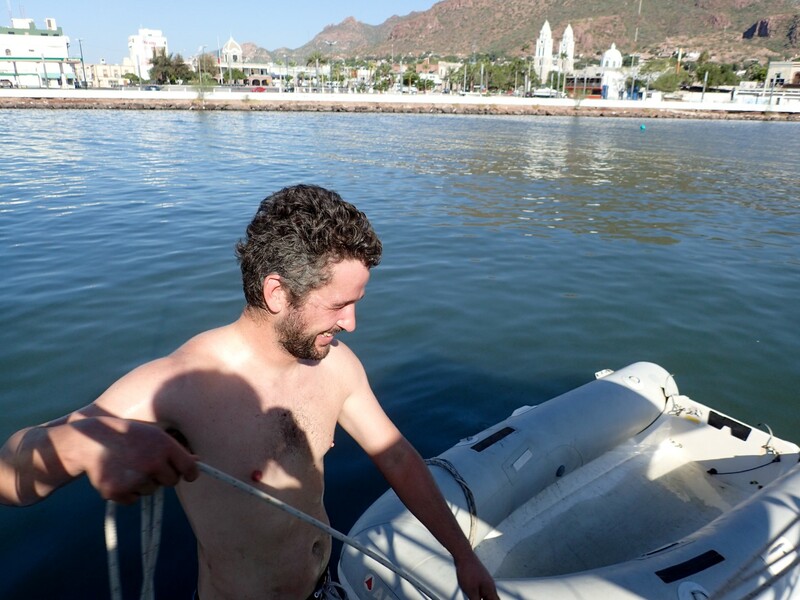 7/11/2018 – Diving under boat – 9:00 AM, 40 feet, 12 minutes – I grabbed my tank and set up my gear to jump in and try to locate a part for the outboard motor Brian lost over board a few minutes before. I searched around until my tank dropped to 300 psi, a new record for me, then headed slowly for the surface and the boat. I always surface with 500 psi or more, but wanted to keep searching and knew it was a shallow dive. 7/11/2018 – Diving under boat – 1:00 PM, 40 feet, 49 minutes – It was a stressful day of working on the outboard, so we went diving under the boat instead of diving in the south Pass. There were hundreds of fish and several sharks. It was a great scene, and a nice change to do a dive without current where we just swam around taking photos of critters. A highlight was a gigantic Crown of Thorns starfish, at least 3 feet wide, perched right under Magic. We both got great photos of it! 7/12/2018 – Fakarava South Pass 40th Birthday Dive! 90 feet, 40 minutes – Brian used the medium lens to get our best yet video of me diving with the sharks in a bikini. The ultimate highlight is a memorable and beautiful 9 second segment of me enveloped by 50 sharks as they swirl peacefully around me and I swim at the camera. Success! We plan to leave Fakarava tomorrow and head to a nearby atoll, Faiite, for a couple days. Today we focused on enjoying the dive and not getting videos of me swimming with the sharks. It is definitely a different experience when you’re focused on getting a certain shot with animals who flee and generally don’t take direction all that well. 🙂 We got great media yesterday and today was a time to relax and celebrate the beauty of the pass. It was a wonderful dive with schools of Fusiler again, and some interesting Silvertip Sharks in the mix. A shallow second dive, since we had only used up half our tanks on the first. We have found the Eagle Rays usually spend time at the shallower depths of the pass, and by doing a second, shallower dive with them we can maximize our time with them. And we did see them today! The highlight of the dive were three juvenile Eagle Rays and two adults! The juveniles were very friendly and I swam right alongside them, getting amazing videos of them. They appeared to be swimming the gravel of the sea floor, searching for things to eat. Beautiful coral and fish, no sharkies! 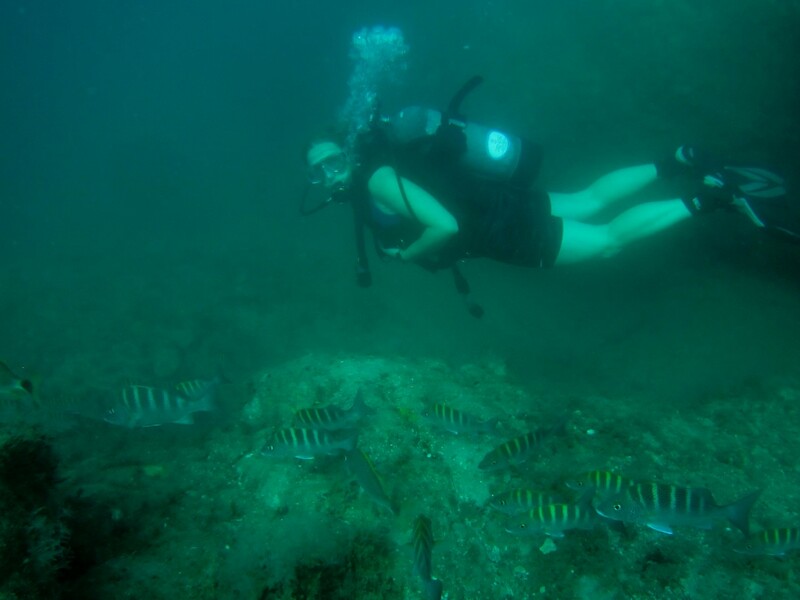 Brian was using the camera, got a fun video of me swimming with marauding parrotfish, tangs, and other critters. Light flood in the pass and lower visibility than normal. Excellent titan triggerfish video! 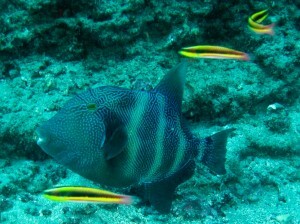 Saw several titan triggerfishes excavating in the pass. The pass was ebbing so we found an interesting place in the lagoon and dropped in to see what we would find. We saw many friendly fish on this dive and a couple sharkies. I got a cute video of some eye stripe surgeonfish following Brian around and trying to eat or play in his bubbles. It’s interesting that some fish seem to love bubbles and perhaps enjoy the feeling of the bubbles tickling them as they swim through them. It was fun being followed around by an entourage of dinner plate-sized fish, as we provided all the bubbles they could handle. The pass was flooding lightly, a beautiful dive with the creatures beginning to act differrently in the daylight. 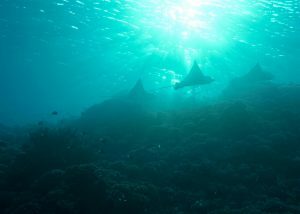 Eagle rays were majestic, and I got a video of them swimming with light beams coming in behind them. Awesome! I love diving the pass at different times of the day. It is a dynamic place. My second time night diving with the sharks in Fakarava’s South Pass. Instead of staying in the eddy near the start of the dive we ventured out into the current and drifted along with the sharkies. I felt a lot more comfortable with them this time, and we drifted along at a shallow depth with them feeding all around us. It was a bit difficult staying away from Brian and it seemed the current was often pushing me right into him. Also this was only my third night dive ever, so I am not used to this. But we did well and I only ended up kicking him once. I felt bad, but he later insisted it’s common for this to happen during a night dive, especially one with current. By getting so comfortable with diving in general and with the support of my wonderful dive partner and husband, I was able to push the envelope and do this really intense videography dive. I got fantastic media for the documentary. Seeing so many sharks darting around in the dark was a crazy scene and it sticks in my memory. One of my best dives ever. 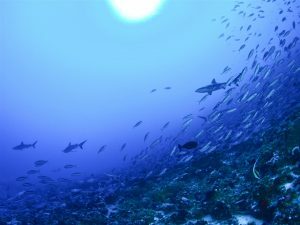 7/22/2018 – Fakarava South Pass 8:00 AM 85 feet, 32 minutes – A great dive with sharkies. I love them so, Brian is getting a little bored with them. 7/22/2018 – Fakarava South Pass 8:45 PM 45 feet, 39 minutes – A shallow second dive with a new tank. We brought all three tanks with us in the dinghy. 7/26/2018 – Fakarava Apron – 9:30 AM, 90 feet, 30 minutes – We’ve seen baby gray sharks schooling at 80-90 feet the last couple days at the apron, but they are usually far away and hard to film. I have become obsessed with getting footage of them in a way that shows how tiny they are. They are like one-foot long copies of the adults. They are especially adorable when they are in a big school together, and today they were more precious than ever. I wanted a video of me swimming with them so Brian had the camera during this dive and didn’t get much footage of me with my baby sharkies. The current pushed us away from them and they started to flee, so we cut the dive short and went back to see them again. I am obsessed with these baby sharks. There were 20-30 of them schooling together today against a backdrop of magnificent coral at 90 feet. It was an amazing scene. 7/26/2018 – Fakarava Apron – 10:15 AM, 1 foot, 2 minutes – We were both in the water and ready to descend to see the baby sharks again when a large, bold Dusky shark started following us around at the surface. We drifted a short distance on the current, the dusky persisted and followed us, doing close passes. We aborted the dive. The Dusky was not acting particularly aggressive, but it was showing a heightened interest in us and was uncomfortably large. 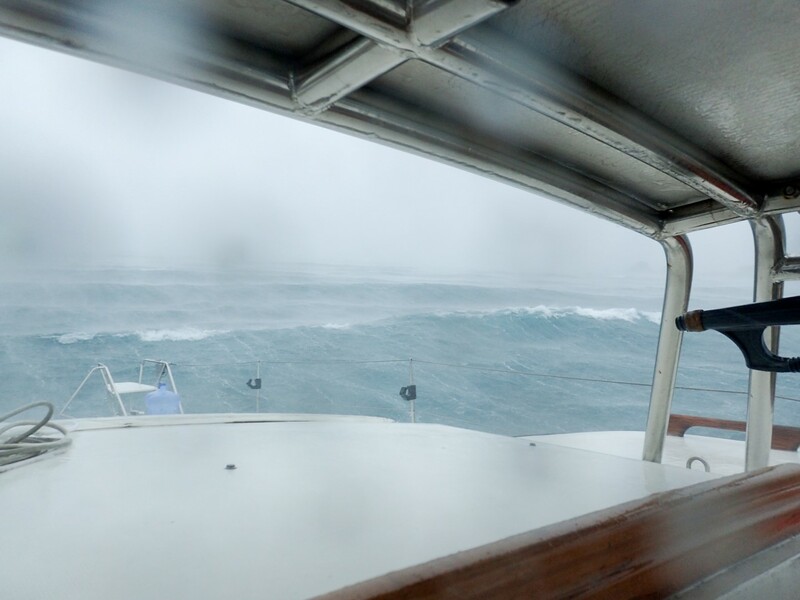 7/27/2018 – Fakarava Apron and South Pass 9:45 AM, 80 feet, 45 minutes – A strong current pulled us all the way from the outer wall through the entire South Pass, an absolutely perfect journey through so many beautiful areas. 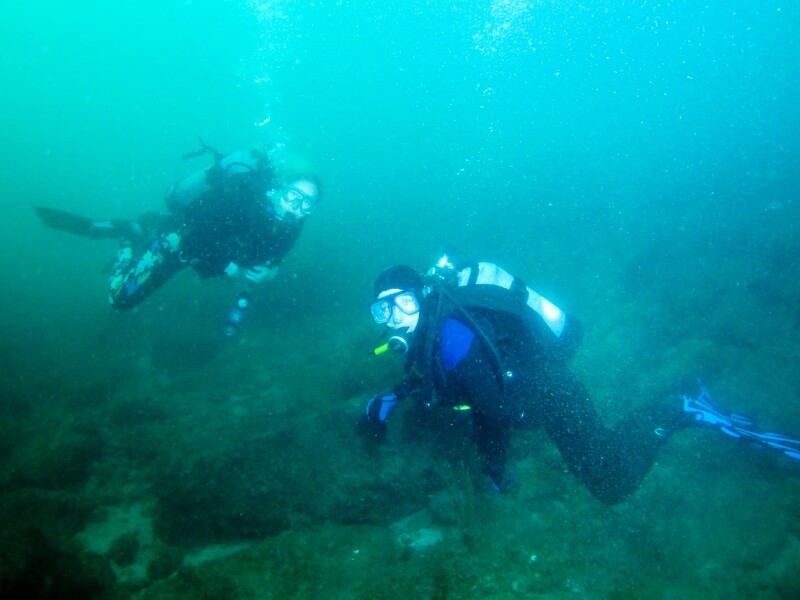 A fantastic dive with great visibility! Very few Grouper are in the pass for the full moon spawning event. But the sharks were beautiful and I made it through the entire 45 minute dive using the 80 (smaller) tank. My air consumption is getting more efficient. I feel so relaxed diving these days. Plus the current carried me along on this dive and I didn’t even have to swim much. 7/27/2018 – Fakarava Apron and South Pass 10:45 AM, 80 feet, 35 minutes – Our last dive was so fantastic we went back and repeated it. We started at the apron again, being careful this time to not spend much time at depth because we absorbed a lot of nitrogen on the previous dive and had only taken a 15 minute surface interval. I kept a close eye on my computer to be sure I was not nearing deco. A strong current pulled us all the way from the outer wall through the South Pass. Another fantastic dive in Fakarava! We’ve been here for a month and I’ve grown immensely as a diver and videographer by spending a lot of time with the captivating and chill creatures of Fakarava. It’s been great to do the same dives over and over, because usually we are always exploring new spots and there are many things to pay attention to when diving somewhere new. Diving the same old reliable places has allowed me to focus on videography and expanding my dive skills. 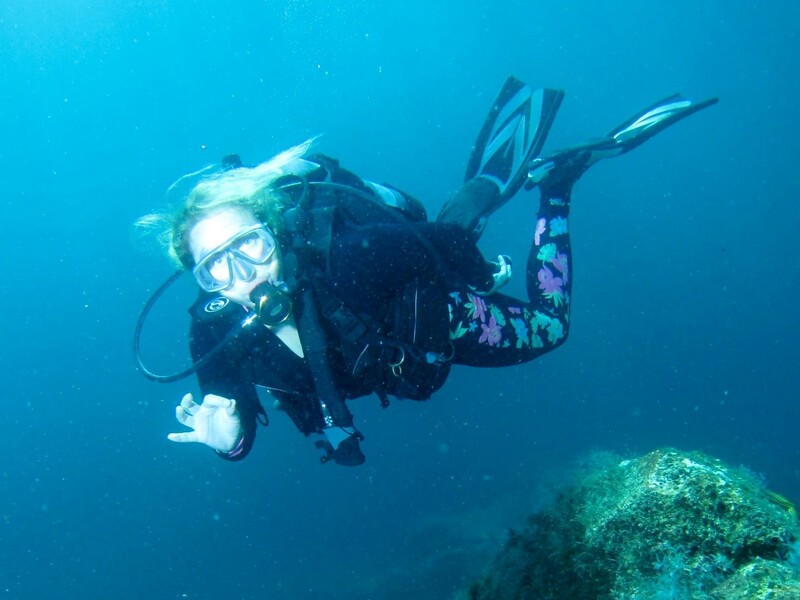 I haven’t been diving in over 10 years! Now that we have a compressor on-board, we’re looking forward to a lot of diving this winter all over the sea. It felt great to get underwater again, and Brian is an amazing dive buddy. I wondered if I would remember what to do, it’s been so long. I’ve always loved diving and I remember how great it felt to join the underwater world for a brief time. As soon as I was in the water, it all came back to me and felt natural. It also brought back many happy memories of previous dives. Critters – Many eels (at least 6), stingrays. We have been referring to this dive as the “eel garden” because there were so many eels of different species, sizes and colors. The first and smallest eel we saw was the size of a sharpie marker. 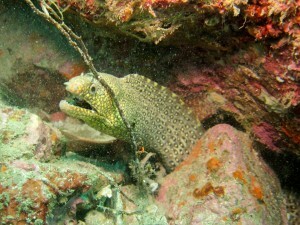 The various eels progressed in size all the way up to a fat, green moray eel which was several feet long. 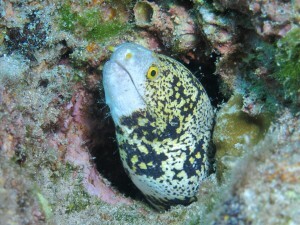 Critters – Free swimming Jewel Moray Eel, many other eels in burrows, stingrays, octopus. 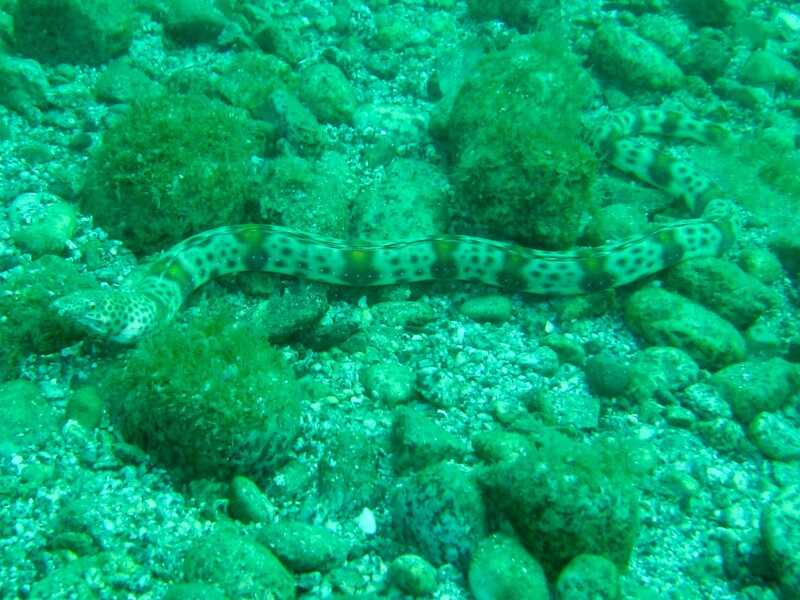 The free swimming eel exhibited some interesting behavior as it lazily made its way along the rocky bottom; it did not appear to be hunting. 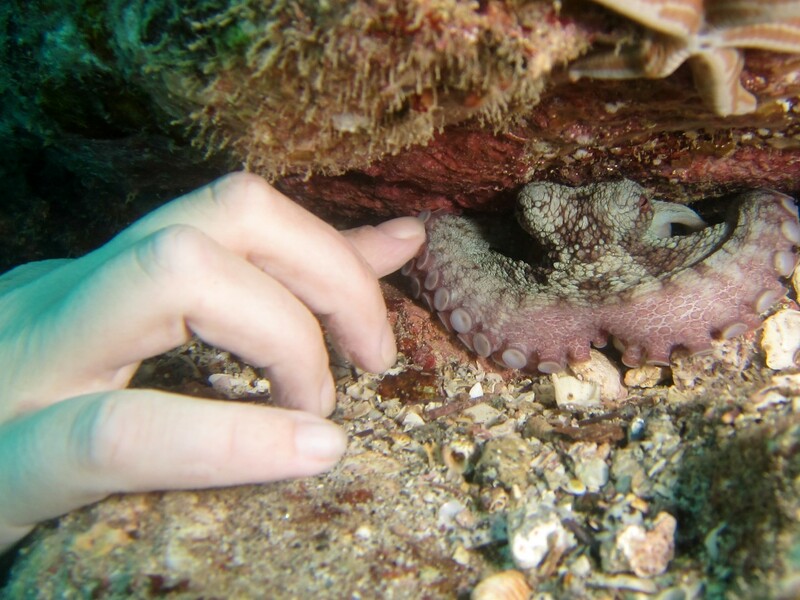 The octopus was nestled in a crack in the rock at around 15 feet so we did our 3 minute decompression stop while taking turns gently petting its tentacles. As we touched it, it gently petted us back, perhaps feeling us just as we were feeling it. Critters – Many schools of fish, many stingrays, two eels in burrows. This site had surge and many fish swimming in large schools. 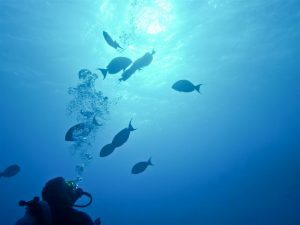 I began to notice some ear discomfort during this dive, and the next day began to have some mild pain and tenderness when I pressed on my outer ear. This is probably “swimmer’s ear” from what I’ve read. It is caused by the ear remaining warm and wet for too long, allowing bacteria to grow. I’m treating it with a solution of half white vinegar, half water, and will lay off diving until it improves. Hopefully soon! 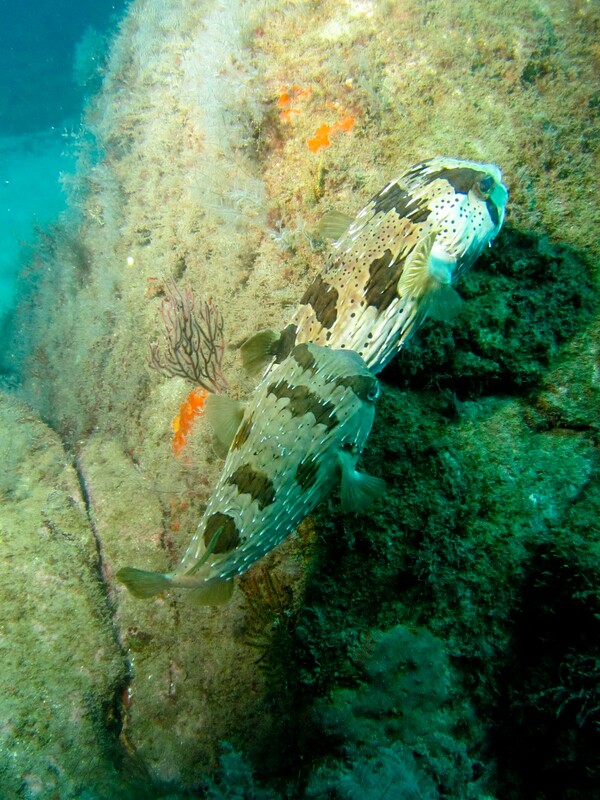 Critters – We saw hundreds of fish, including two large puffer fishes. One puffer was chasing the other, perhaps trying to convince it to mate. My self-diagnosed swimmer’s ear is better after treating it with vinegar and water, and I was excited to go diving again. 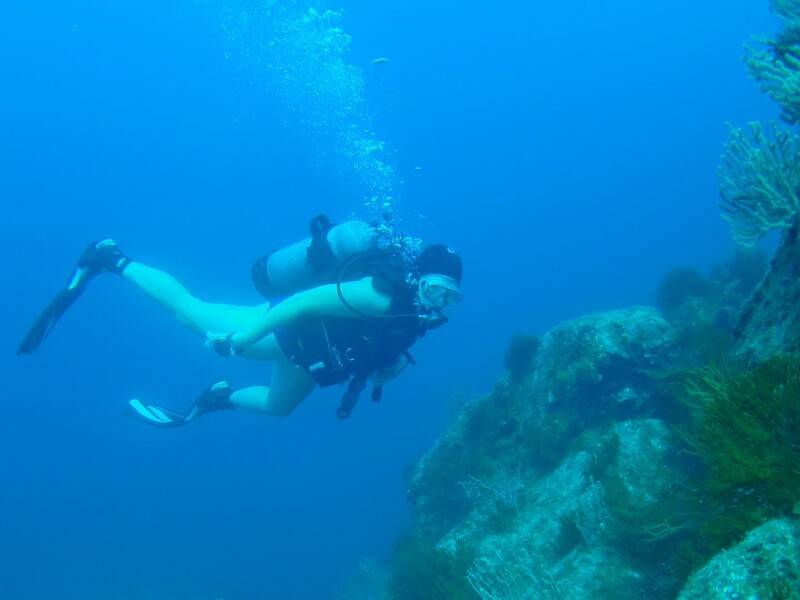 This dive had the best visibility so far in the sea – about 60 feet! Wonderful! We surfaced halfway through the dive to check my regulator. It would occasionally make a gentle groaning sound when I inhaled, although it delivered air normally. It’s never done that before so we tried to reproduce the groaning sound with no luck. We practiced sharing air and then continued the dive without hearing the noise again. 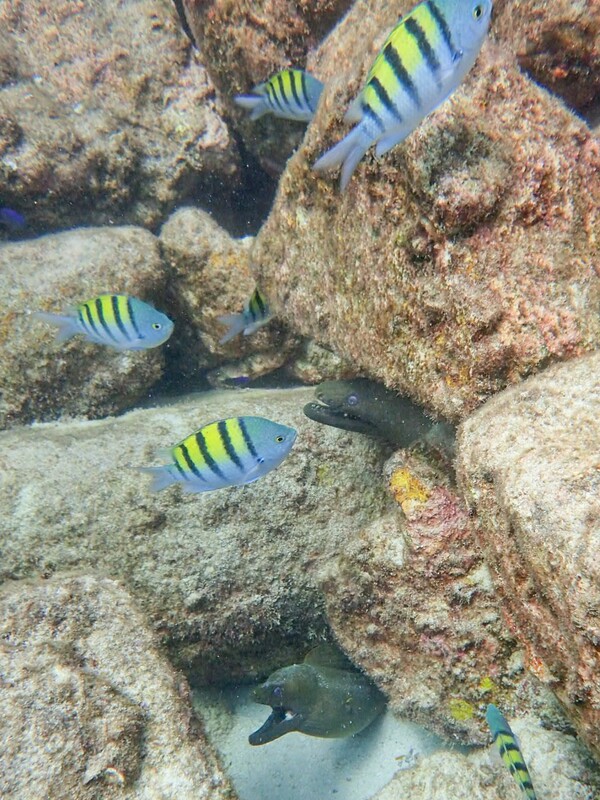 Critters – Five plump Green Moray Eels, one free swimming between rocks! We also saw the first Nudibranch of the season, a very small, neon colored beauty hidden in a sea of coral and rock. A purple octopus retreated to its lair quickly after being spotted. On the rocky bottom sat a red and black sea star feasting on a huge, dead lobster. We saw hundreds of fish, too. It was a long, mellow, shallow dive with many fun critters. Critters – We saw dozens of stingrays swimming around a large sandy area. I saw one flutter up out of the sand right next to me. We also saw a couple lobster, one eel, and hundreds of fish. There was a bit of surge and current at this site. 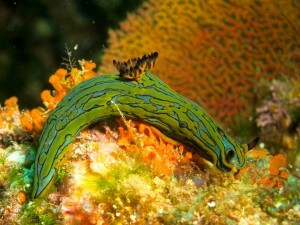 Critters – We saw hundreds of fish, one Jewel Moray Eel and one lobster. The lobster and the eel were both skittish and retreated to their caverns when we peered at them. Brian spent some time hovering around a very docile Scorpionfish. This particular fish tolerated us for several minutes as we enjoyed its grizzled appearance and Brian took a dozen photos of it. The water temperature dropped noticeably after two weeks away from the sea. It went from 84 to 78, and we could really feel the difference. Bikini diving season is coming to an end and soon we’ll be wearing neoprene. Algae seems to have bloomed recently in the sea, reducing our visibility to about 25 feet. 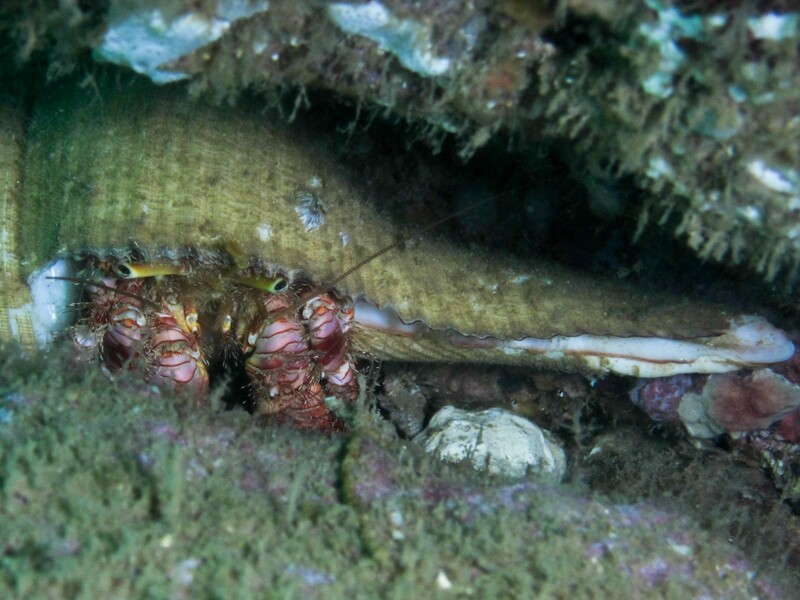 Critters – We saw hundreds of fish, one Moray Eel and one huge hermit crab, with a shell about six inches long and a cute, captivating face with tiny, buggy eyes. The coral was the best we’ve seen in the sea this season, probably due to the strong currents at this site. When we were behind the rock the current was strong but manageable. However, once I rounded the corner and left the protection of the rock I had to find something to cling to so I wouldn’t be carried away! I felt like a rock climber as my fingers searched for a tiny hold to latch onto. I’ve only done one other dive in such strong currents. It was in New Zealand on a guided drift dive at the Poor Knights Islands. After we returned to the anchor line we decided to surface with over 1000 psi remaining in our tanks because the current at this site was much stronger than expected. We felt we handled the current safely with Brian using a line and reel to ensure we didn’t drift too far, but we also don’t want to push the envelope too much with strong currents and diving from an unmanned boat. Critters – We saw hundreds of fish, two Moray Eels and a beautiful black flatworm with yellow and white spots. There was some mild current but it was nothing like our earlier site. It was a mellow dive as we meandered along on gentle currents and enjoyed many interesting sea critters. Critters – Just a few minutes into the dive we spotted a beautiful, three foot long Snake Eel slithering across the rocky bottom. Its skin was orange, brown and cream. This was our first time seeing a Snake Eel in the sea. We also saw many fish and at least twenty stingrays. At one point, we were in a formation much like a hallway with rock walls on either side and a sandy bottom. The stingrays loved this hallway and they were fluttering all over the place. At one point I was swimming a couple feet up from the sandy bottom and four fluttered out of the sand right beneath me. Great dive. Critters – We were swimming back to the anchor line looking into rocky crevices when, out of the corner of my eye, I saw two tiny eyes peering over the top of a rock. It was a small octopus, exactly the color of the rock! This intelligent animal watched me closely, then watched as Sue and Brian also approached. The octopus remained tolerant of the three of us staring at it from close range, but the moment I touched one of its tentacles it retreated to its lair and placed a shell at the entrance to block us from entering. It was a memorable encounter with a sentient and watchful sea creature. We also saw many eels and fish. 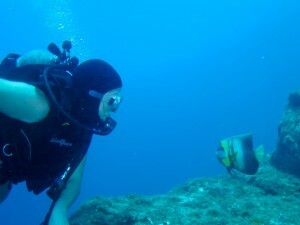 This was my first time diving with my mother in law, Sue. The photo is of she and I.
Critters – One moray eel, a few sea lions, and some Trigger Fish showing interesting behavior. 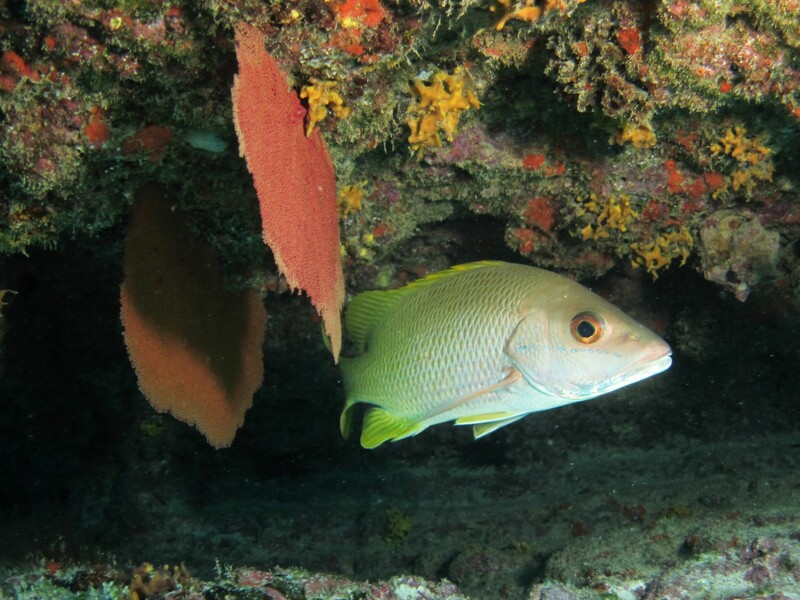 There were many horizontal cracks in the rock and coral, and when we approached the trigger fish for a better view they would turn on their sides and shimmy into a crack, wedging themselves in tightly. The visibility was spectacular – about 80 feet. 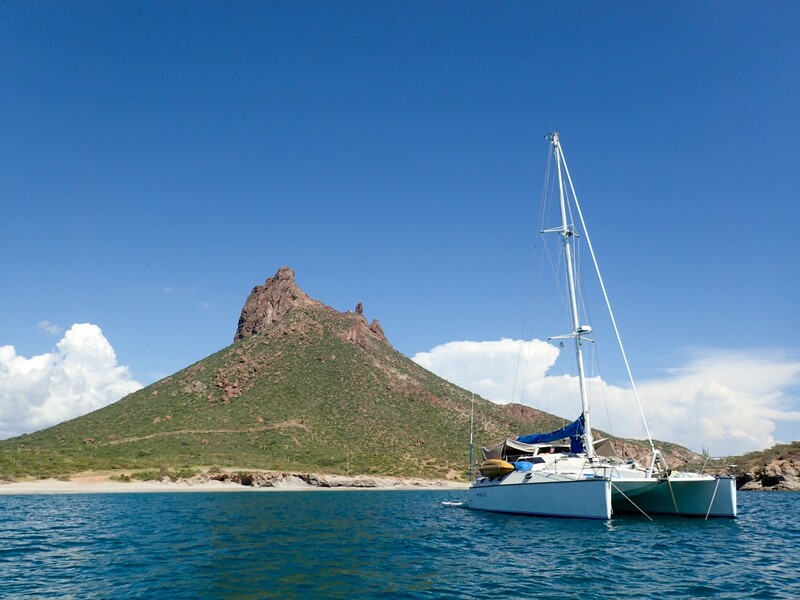 It’s the best we’ve seen in the Sea of Cortez this season. Wonderful dive. 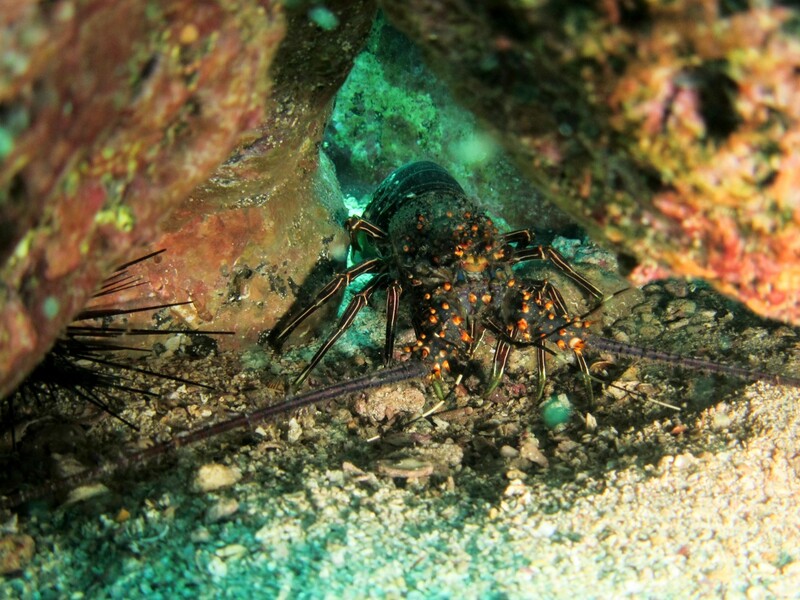 Critters – Two moray eels, many sea lions, one tiny lobster and an octopus! Sue found the octopus right at the end of the dive. Brian and Sue attempted to hold the octopus but it was not in a friendly mood, and inked them before it darted away to find peace and solitude. This dive was late in the day so there was not much light in the water, however visibility was great and it was an enjoyable dive with much to see. I got chilled on this dive for the first time this season. I think it’s time to begin wearing some neoprene. Critters – One moray eel, many sea lions and fish. Tim saw a gigantic lobster. About 15 minutes into the dive I found myself feeling increasingly uneasy about the darkness of this late afternoon dive, poor visibility (only about 30 feet today) and sea lions. Brian, Tim and Sue had all experienced aggressive sea lion behavior at other sites on San Pedro Island, so I would watch the behavior of the sea lions closely while diving with them. The water was dark and large sea lions would appear suddenly out of the darkness, swoop quickly through the water near me, and I didn’t like that one bit. After a few minutes of feeling uneasy, I decided I wasn’t enjoying this dive at all and didn’t want to continue. I wrote this on my tablet and showed it to Brian and Tim, who already knew I was a bit uneasy about the sea lions and their aggressive behavior: “I don’t like this. It’s dark and vis is poor.” I gave the hand signal to turn around and we swam back to the anchor. We began our ascent and stopped at 15 feet depth for a 4 minute safety stop. During this safety stop a medium sized sea lion charged us repeatedly, and once it came at us with its mouth open wide, showing its yellow, jagged teeth. I huddled against Brian with my limbs tucked in, not moving. 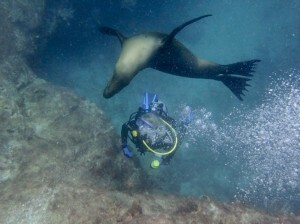 Tim fended off the charging sea lion with his large dive light, being careful to never turn his back on the animal. We completed the safety stop and I was glad to ascend. This was not my favorite dive but it was a valuable opportunity for learning to deal with discomfort underwater, staying calm, and remembering the importance of the safety stop when I really would have just preferred to surface and get away from the charging sea lion. Critters – Many non-aggressive sea lions and fish. Once again visibility was poor, so we decided to stay at shallower depths so there would be more light and the sea lions would be easier to see. 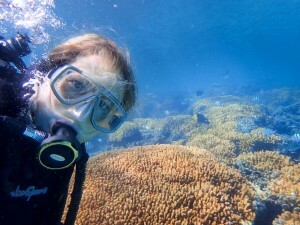 This worked well for me and I felt comfortable diving with them in these conditions. They were in a very playful mood and exhibited no aggressive behavior today. I relaxed, enjoyed their underwater acrobatics, and shot many photos of them. 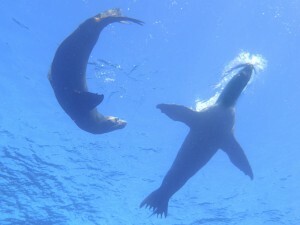 At least a dozen sea lions swirled around us and they seemed genuinely pleased to share their underwater world with us! When they are being nice, there is nothing better than diving with them and seeing them up close. Sea Lions are the only animals I have ever been in the water with that seem genuinely interested in interacting with divers and also the only animals who seem curious about the stream of bubbles flowing out of a scuba regulator. I’m so glad my last dive with them on a high note, instead of leaving San Pedro with memories of that sea lion charging in dark water. Critters – Stinging jellyfish, sting rays. We cut our dive short after Brian got stung several times by a jellyfish. When we ascended, there were tentacles strung out along the anchor line, too. Gross! There are a lot of jelly fish and visibility is poor (30 feet). We’re done diving here. Critters – A lot of Sargeant Majors, Cortez Angelfish, Parrotfish, and many other busy reef fish. We crossed the sea and found much better diving conditions on the other side! We named this dive The Aquarium for all the fish and the great visibility here (60 feet). Critters – Many eels and fish on a shallow reef. In the photo at left are two eels with homes right above and below each other on this busy reef! We saw plenty of colorful fish including sergeant majors, leopard grouper, parrotfish and coronet fish. We took the dinghy about a mile from Magic to explore a small island and found great visibility there. 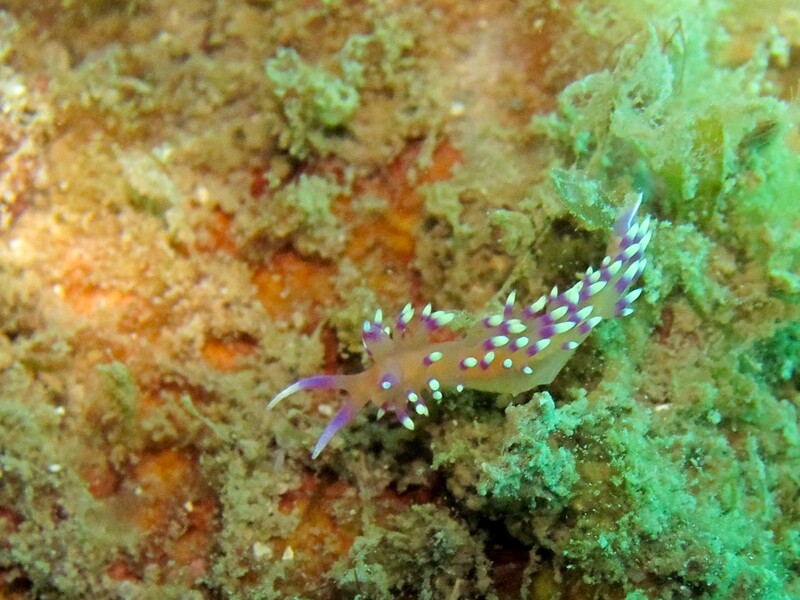 Critters – We love seeing Nudibranchs on our dives. 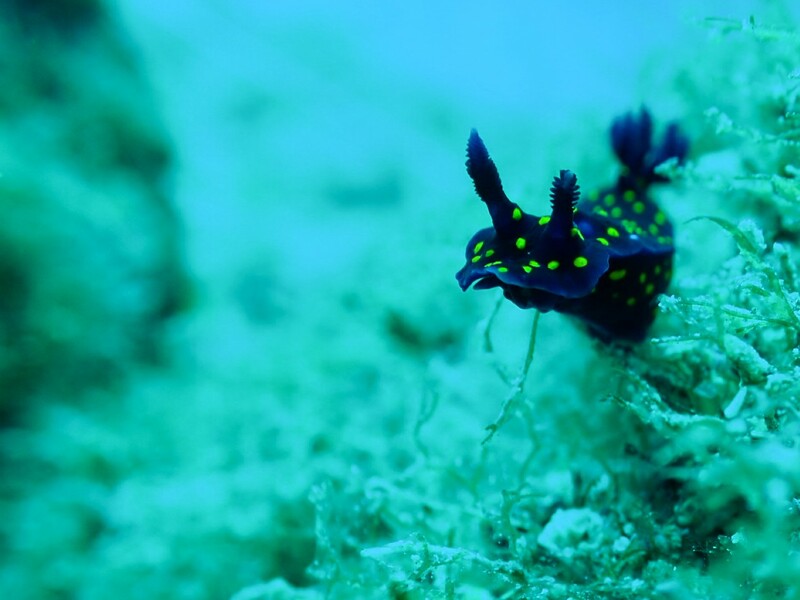 Our favorite critter this time was a dark blue nudibranch with prominent, feathery gills and antennae and bright yellow spots. A school of Golden Trevallys swam right by us early in the dive, and must have been two feet long. The combined mass of them was easily 15 feet wide. They were briefly interested in us. Critters – We saw many creatures that are never around during our daytime dives, like dozens of four-foot-long sea cucumbers, sea hares, sea cucumbers, and big sleeping fish. It was fun to get a closer look at several huge fish which would normally never let me get near them while they are awake. 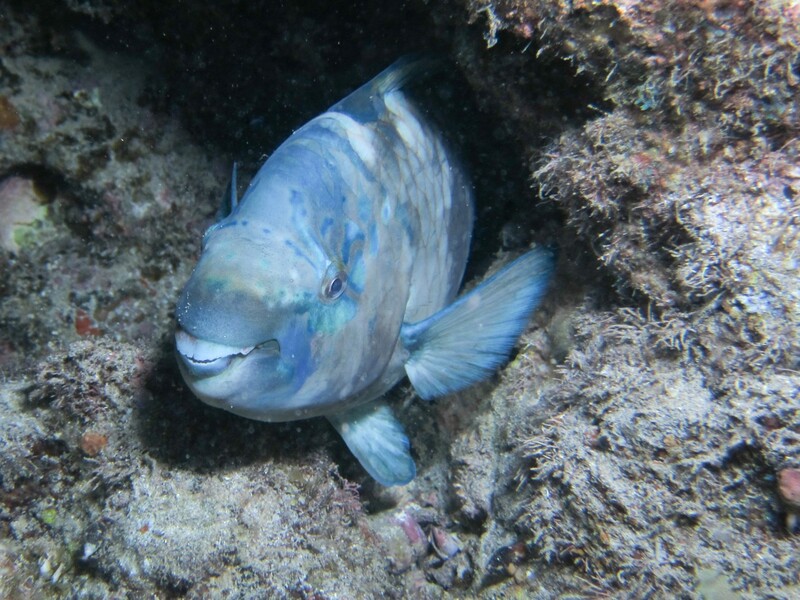 The parrot fish pictured here was really cute, suspended in a little cave with a toothy grin on his face! The fish sleep with their eyes open and are so entranced that we could swim right up and touch them. 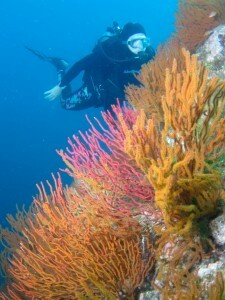 Critters – Colorful gorgonians (coral) in red, purple, blue, white, and orange. Many eels and fish. I was stung by a jellyfish late in the dive on the arm. The pain was pretty intense, but the beauty of the dive made up for it. I need to wear my protective skin for all dives now, apparently. Critters – We enjoyed many colorful Gorgonians again, and spent quite a bit of time taking photos of them. This is the best coral we’ve seen anywhere in the sea! 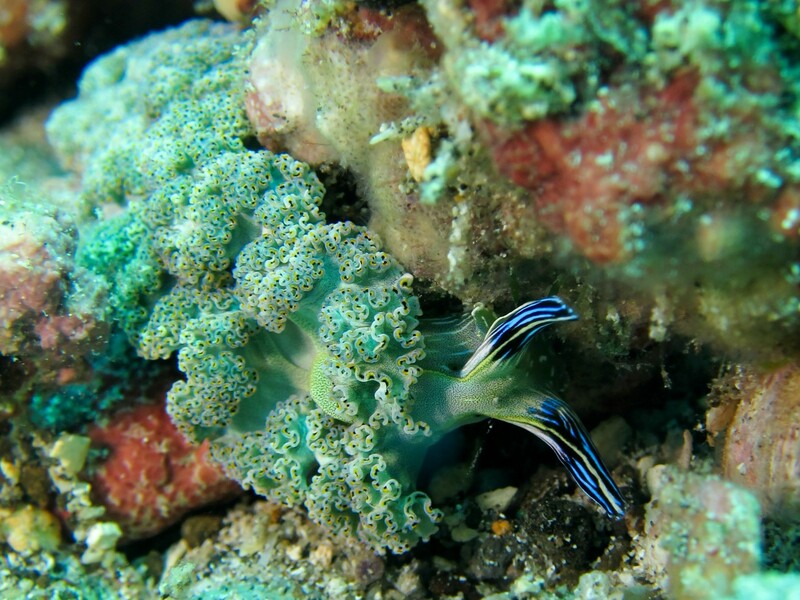 We also found many small fish hidden among the large corals. Critters – Los Islotes always has many fish, but the side of the island we chose seemed to have fewer fish than usual. We saw a couple sea lions during the dive, but they were not interested in us. 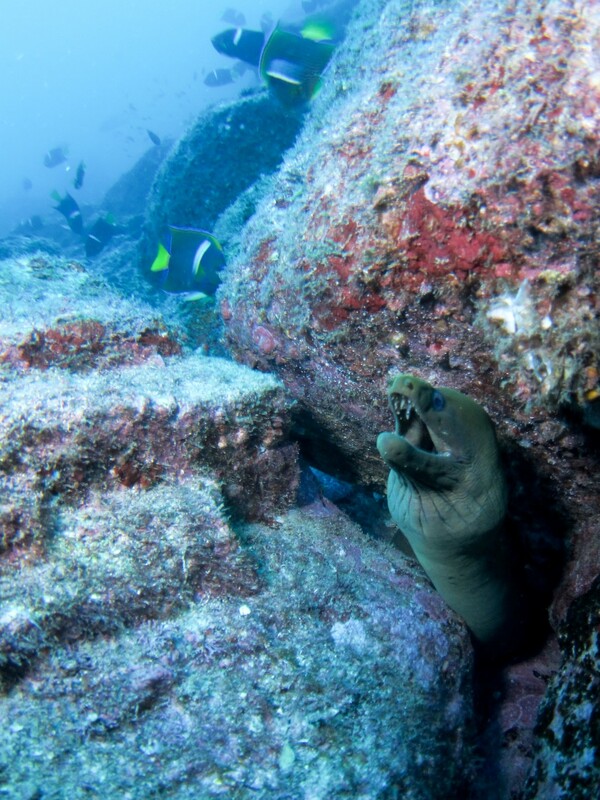 As we ascended at the end of the dive, we saw a couple sea lions chewing playfully on the anchor and anchor line as if it were a chew toy we brought just for them. 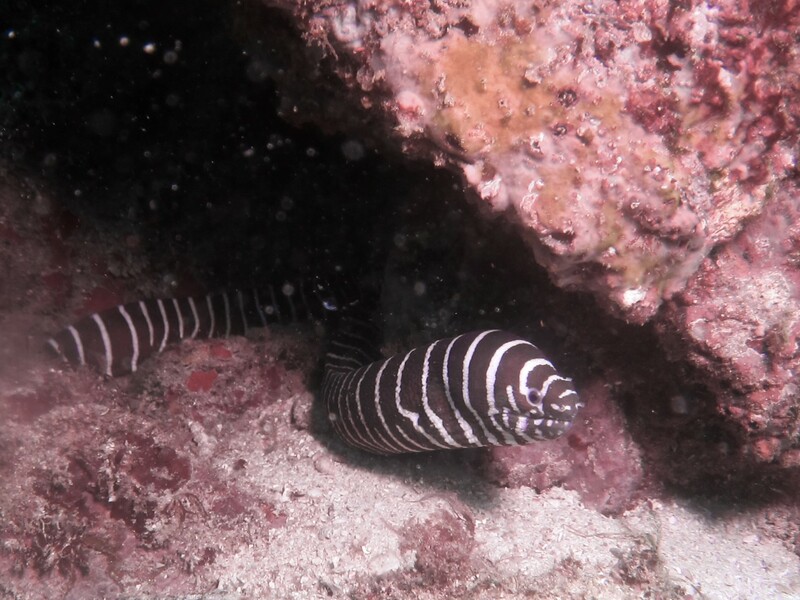 Critters – Brian pointed out a Snowflake Eel toward the end of the dive, which I had never seen before. It was beautiful with yellow and gray markings. Brian saw a sea lion, but I was watching fish intently and missed it. That was ok with me. This dive featured a scattering of small coral heads around the area where we did our safety stop, and as we peered into these coral heads we saw an amazing number of small critters using them for shelter. Many colorful crabs and small fish entertained us for quite a while, and Brian took many macro photos as we explored the coral heads at a depth of about 20 feet. That is the reason this dive was 109 minutes long. It is probably our longest dive to date! Critters – Schools of fish, many Moray Eels and one small ray. 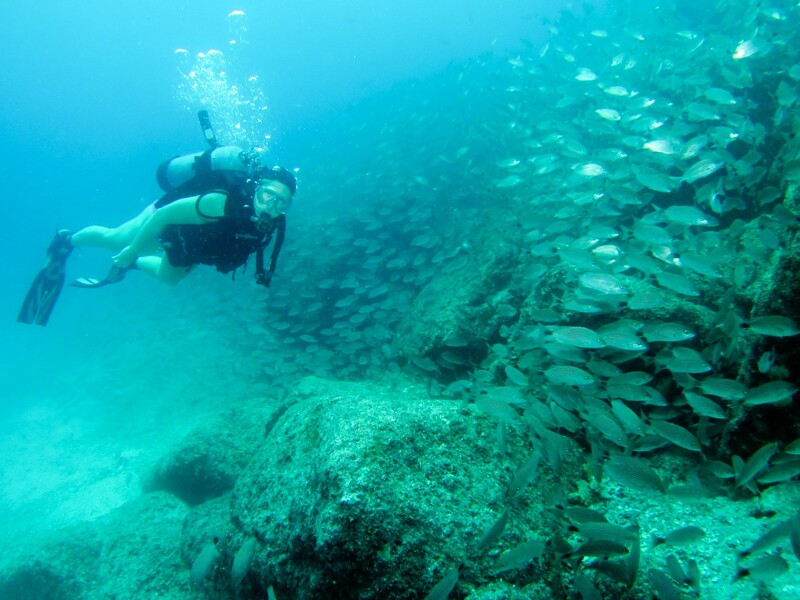 This is one of our favorite snorkeling spots near La Paz and there are always many busy fish swarming the coral reef. The orange coral heads are large and flat on top, offering a perfect opportunity to peer into the coral and see the small creatures who call it home. Critters – Plenty of fish here, as always. We also saw several Moray Eels and some larger fish. We went out to the point at San Gabriel, but it never truly dropped off and we remained at around 30 feet. Although this site is best done as a snorkel, we knew it would be awhile before our next dive since we’re headed to the US for the holidays. We enjoyed the fish, coral and plenty of light in the water. Critters – At the beginning of the dive Brian found a Zebra Moray Eel, which was very exciting. I had never seen one before. We enjoyed it for awhile, and then moved on and I spotted yet another Zebra Moray! What luck! We also saw schools of fish and at the very end of the dive Brian spotted a flounder camouflaged in the sand. Its small eyes were poking up from the sand, and that gave it away. 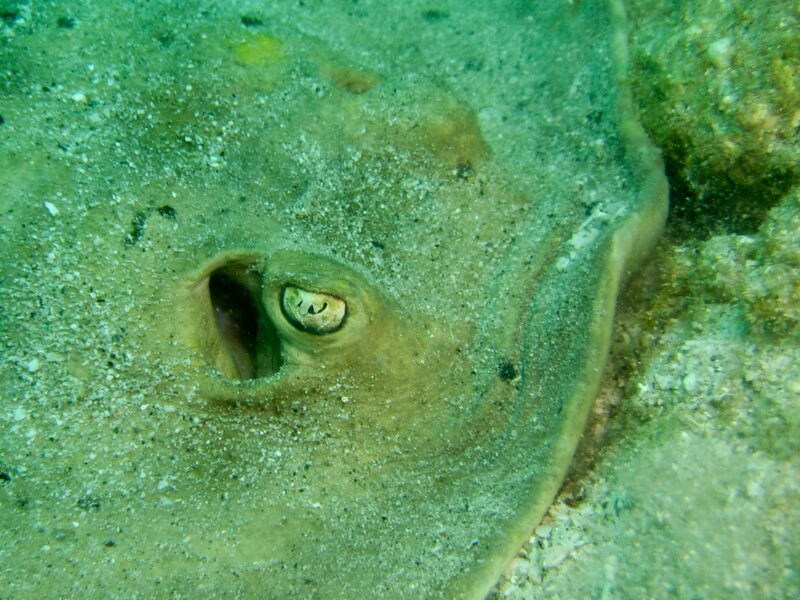 This was our first flounder encounter in the Sea of Cortez. 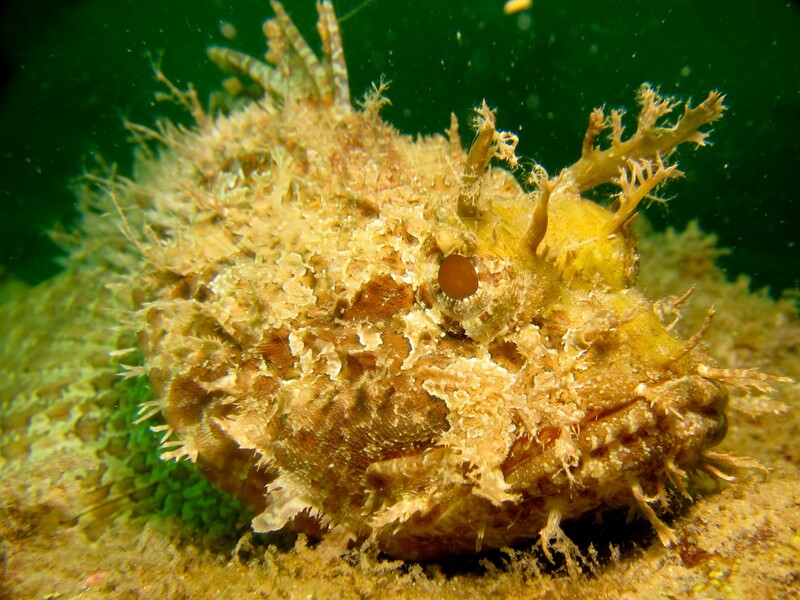 This fish begins life with one eye on each side of its body, and as it matures both eyes move to one side, allowing it to lay flat in the sand with both eyes watching for prey. Critters – We saw many large fish, including a school of shiny, silver jacks. They always caught our eye and never allowed us to get close for photos. We saw a wonderful ruffled nudibranch with neon blue antennae. We also saw many small fish and enjoyed good visibility for Pacific Mexico (30-40 feet). 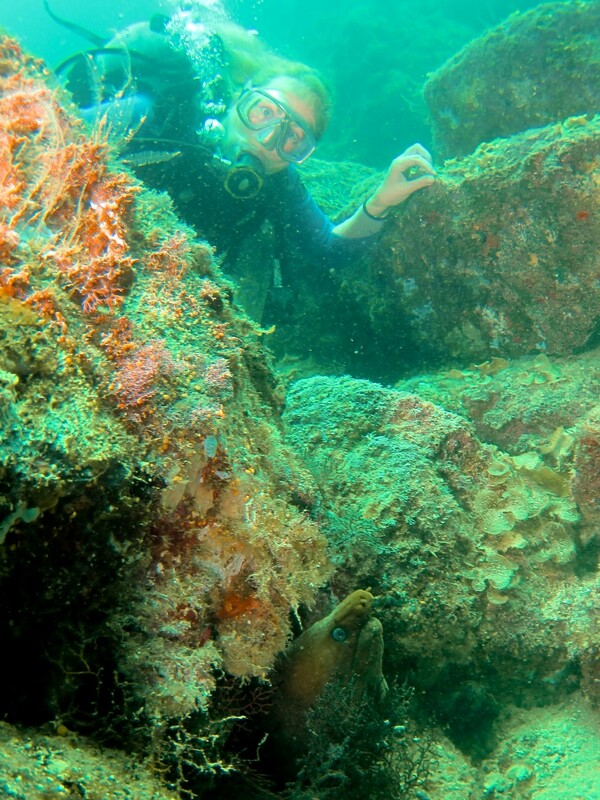 Critters – We went diving right under the boat. I was trying out Brian’s dive gear, and found it did not fit well so this was a short dive. I currently use a bulky women’s jacket-style BCD which I bought over ten years ago. It is still in good shape, but is larger than it needs to be and has a “cummerbund” that often shifts around and comes loose. I wanted to try Brian’s backplate style BCD. I found I really liked the way it floated, and it makes it easier to float horizontally. 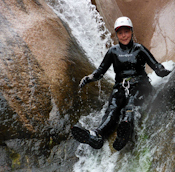 However, the un-padded straps cut into my shoulders and began chafing my skin a few minutes into the dive. I would like to get a backplate style BCD, but one that is cut specifically for women and has a bit of padding so it’s comfortable against my skin. There is nothing better than a bikini dive in warm water and I want the BCD to be comfortable without a shirt under it. Critters – We saw many fish and a surprising number of lobsters. Most lobsters were small, some were medium sized. They seemed to like being in a group. A wall with many rock ledges gave them many places to hide. We also saw moray eels under these rocky ledges. We had already used a portion of the air in our tanks on the previous dive, so we used our remaining air on this short and shallow dive. Critters – This was our last dive at Isla Isabel and I spotted my favorite eel hiding under a rock! A Zebra Moray is always an exciting find. 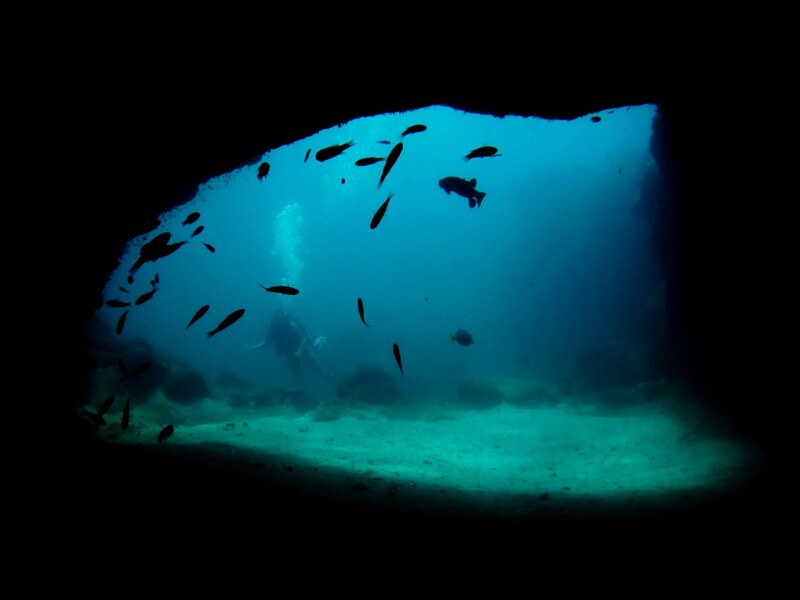 We also saw many fish and green moray eels, and the caves and arches underwater were fun to explore. Critters – We were surrounded by huge schools of fish for most of this dive. We also had great visibility of about 50 feet. This was one of our best dives in the sea so far. A large turtle even cruised by, about 30 feet away from us. It was exciting but we didn’t get a close look at it. Many of the fish swam near us, curious and photogenic. Critters – Fish, eels, plenty of current. I had a funny encounter with a large eel. I was clinging to a rocky outcropping to avoid being swept away by the current, when around the corner comes this huge eel. He’s swimming really fast right toward me, flying on the current. Then he spots me. He was about 5 feet away. He froze and then began swimming backward, in reverse, eyeing me. If an eel could show emotion, I could see a surprised look on his face as he slowly backed away from that very strange creature emitting bubbles! 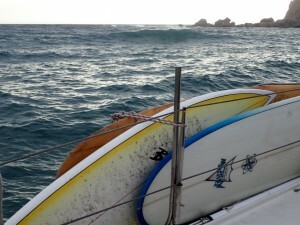 Critters – We took the dinghy about a mile from Magic and anchored next to rock. The bottom was large, course boulders and coral. This dive was really nice. We didn’t move around all that much but there was a lot of macro life. 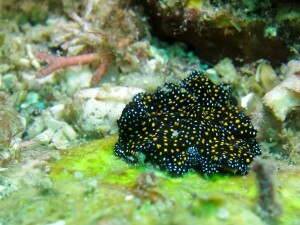 We saw two nudibranchs, one pictured and one with black skin and tiny multicolored dots. They are such fascinating macro creatures. 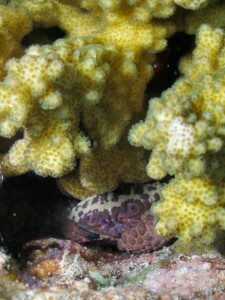 A large Moray Eel lived in a nice crevice surrounded by different colors of coral. I posed for some photos next to this giant, and made sure I kept a safe distance from his special crevice. This was a very colorful area. Location – Rock near the north tip of Danzante. We snorkeled and saw a wall dropping off steeply and decided to dive there. Critters – Golden Grouper, fish, great macro wall with many things to see. We found a thermocline at around 55 feet, and I got very cold when I dropped below 55 feet to see a small cave filled with colorful coral and fish. I didn’t respect the cold, and continued with my core temperature very low. While trying to get into position for a photo at the end of the dive, I flailed my arms and cut my fingers on some coral. Usually I move very gently and carefully underwater, and suspect my coordination suffered as I got colder and colder, resulting in my less-than-graceful movements. Ugh. Yesterday evening we experienced the worst ocean storm either of us has ever seen. It was fast and furious. It appeared out of nowhere, clobbered us for a couple hours, and then left just as quickly as it arrived. It wasn’t in the forecast, but after the storm Brian found websites to view satellite images of weather which clearly showed a horrible storm was headed our way. We’ll be monitoring these satellite images closely in the future. The Mexicans refer to this type of storm as a Chubasco. We’re nearing the end of the summer monsoon season, which is when these storms are active. Hurricane season. Chubasco season. What an adrenaline filled honeymoon it’s been. It had been a calm day. The breeze was light and the ocean was nearly flat. I stayed on Magic and worked while Brian went scuba diving. He returned and the sky clouded over. I took a short nap on the trampoline and woke up to a light rain. We ran around closing hatches and bringing things inside. Within an hour, the light breeze had increased to a tropical storm force wind (39+ MPH). Our wind meter is broken so we will never know just how strong the winds were, but we both agree they were well above 40 MPH. The rain became so heavy it stung my skin painfully. There was thunder and lightning. 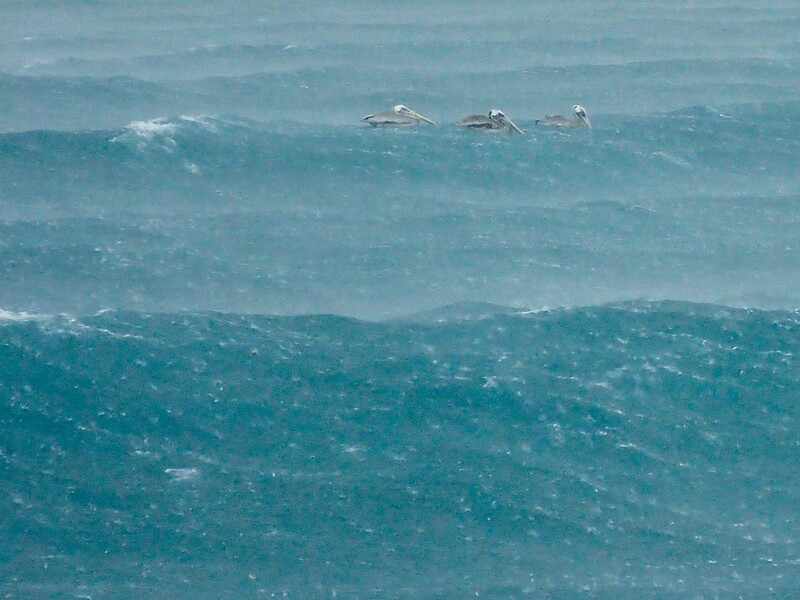 A few brave pelicans rode up and down the huge crests and troughs of the waves. 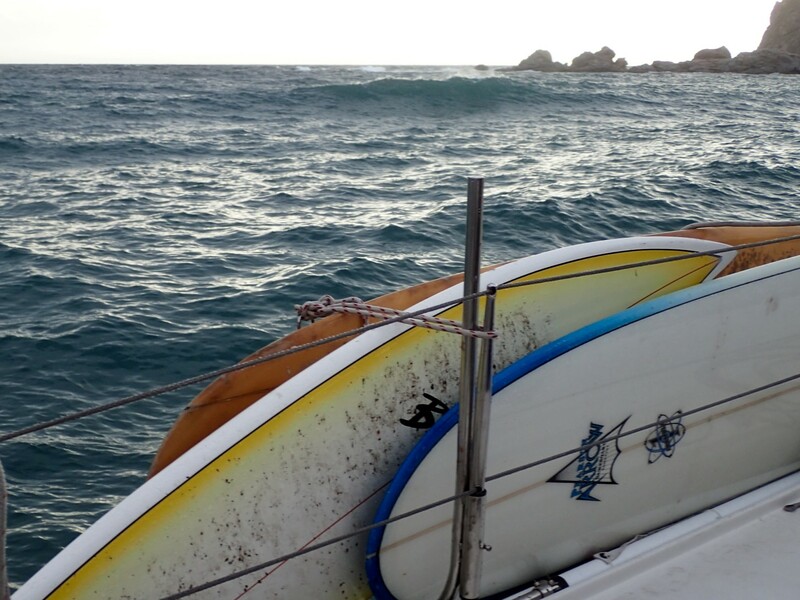 Some of the waves smacked the bottom of the catamaran with a loud boom, which has never happened before. A few things fell over inside the boat, which has also never happened before. 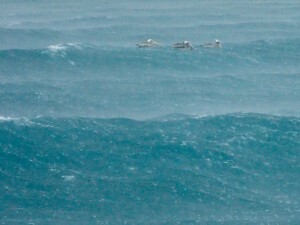 Magic rode out the storm with grace, her four corners dipping into the ocean occasionally. She’s a blue water boat made for crossing oceans and she felt safe and stable in these waves. However, we were anchored only about 300 feet away from a very rocky shoreline and we didn’t have a lot of options if the anchor started moving. In the worst of the storm, Brian adjusted the anchor to let out more chain. This brought us a little closer to the rocks but it was the best thing to do because it made the anchor hold more securely. When I watched him at the bow of Magic, leaning over to adjust the anchor with the boat pitching forward so much his arms were in the water, I felt pretty nervous. The storm was over within a couple hours, and then the huge, rolling waves continued into the night. We haven’t seen any other cruising boats out here, which is eerie. Last season we saw a lot of cruising boats all over the sea. Does everyone else know something we don’t? 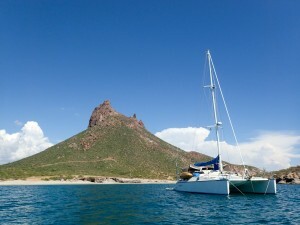 Are we out on the Sea of Cortez a little too early? We were so eager to get out on Magic and begin diving that now we’ve gotten to experience both hurricane and chubasco season. Lucky us! We love remote anchorages, and the photo to the right is our current location on a calm, sunny day. We’re surrounded by mountains, beaches, and cactus and we’re close to nice places to dive. However, after this storm we talked about tying up at a marina until these extreme weather seasons calm down. We can use the dingy to go diving when the forecast looks good, and enjoy the safety of the marina when things get ugly. We’re going back to Phoenix for a few days until Hurricane Odile passes. Our plan was always to drive down to Mexico, drop off scuba gear and a huge compressor at the boat, drive back to Arizona, and then take the bus down for an extended trip so we don’t have to leave our car in Mexico. Mexico’s Baja Peninsula is a scary place to be right now. Odile, a class 4 hurricane at sea, became a class 3 hurricane as it raged up the Baja Peninsula near Cabo San Lucas and La Paz this morning. To the left is an image from this morning of hurricane Odile’s path up the peninsula, with a red heart near the current location of our boat. We’re postponing our honeymoon for a bit, or maybe this IS the honeymoon as we work together to deal with this hurricane that threatens our boat. I was more anxious to leave than Brian and more concerned about the hurricane. We checked the hurricane forecast together every few hours, even in the middle of the night. 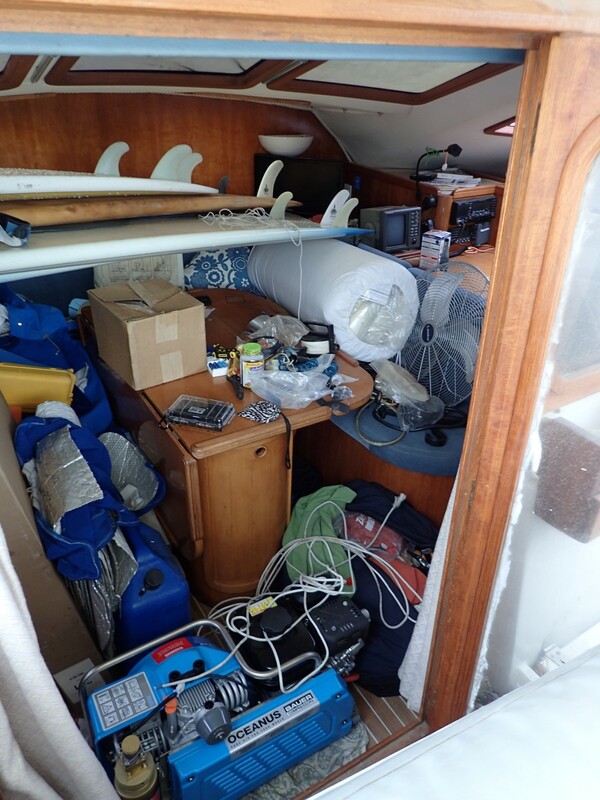 We secured the boat, loaded all our toys inside the main salon, and tied everything down tightly as we waited for the big winds to come. I was getting more and more worried about the hurricane and wanted to go back to Phoenix to wait it out, the sooner the better. Brian wanted to stay and protect the boat. We talked about my taking the bus up to Phoenix alone but I couldn’t bring myself to leave my husband in this storm, and especially during our honeymoon. Brian is a wonderful partner who respects my comfort levels and wants to keep me safe and comfortable on these big adventures we enjoy. When I read reports that Hurricane Odile could be “historic” and “record-breaking” and I saw it heading up the peninsula instead of staying out in the Pacific Ocean, I wasn’t sure what it would do next and didn’t want to be anywhere near it. I have no experience with hurricanes, all I know is they can be unpredictable and this was a very, very big one. Brian wasn’t worried about the storm, but he was still willing to go back to Phoenix so we could stay together. This is one of the reasons I love this man so much, feel so safe with him, and want to experience life with him. He’s incredibly brave but he accepts that sometimes I’m not. When I’m apprehensive, we figure out how to make things more comfortable, which in this case meant leaving Mexico for a bit until this big hurricane dissipates. We’re also waiting to see if another disturbance in the ocean turns into a hurricane within the next couple days, which is likely. Also, I am reaching my stress threshold. Our wedding was fantastic but intense, and then we drove all the way from Idaho to Mexico only to be greeted by a “historic” hurricane. We are really looking forward to our honeymoon cruise with plenty of relaxation, scuba diving, fresh fish, pina coladas and colorful sunsets, but that may need to be delayed a bit. At least I have a 90 minute massage to look forward to in Arizona, hot yoga, and just plain relaxation before returning to the possibility of hurricanes and more ocean drama. It’s been a very active year for hurricanes in the East Pacific Ocean and now with the Sea of Cortez getting nice and warm (which is great for scuba diving) it tends to draw storms toward the Baja Peninsula. The latest hurricane, Odile, was especially strong. It caused plenty of damage, but at least no casualties have been reported at this time. We’re so thankful our friends in La Paz are ok and we’re waiting to hear how much damage has been done to the city. I’ve learned a lot about hurricanes lately. We’ve been really thankful for the efforts of the US National Weather Service and their hurricane forecasting website. The brightly colored cones showing the predicted winds both frighten us and comfort us, but at least we are informed and can move away from a big hurricane if needed. Advanced weather forecasting data is one big reason we recently got a device for satellite internet on the boat. Our new device, made by Iridium, is new and pretty exciting. I’m looking forward to seeing how well it works for us. It will be a low bandwidth connection, but we can use it to work occasionally and check weather forecasts while we’re in remote places without any cellular service. I tried on the white gowns at David’s Bridal. They looked nice but felt boring. None of them felt exciting when I tried them on and looked in the mirror. My favorite was one of their designer ball gowns with a corset top, but it was white and didn’t come in other colors. This would probably be the fanciest dress I would ever buy and I wanted to genuinely love it. White is just not my color. I thought back to the Quinceañera dresses we saw all over Mexico during our last long sailing trip. Now those were exciting dresses, always in bright colors like turquoise, pink, red, yellow, cobalt blue, even lime green and always with a ruffled, poofy skirt and fitted, sparkly top. I tried on a couple Quinceañera dresses at a store in Phoenix and fell in love with them, but they had very limited styles in stock. I looked through the catalog, lusting after all the dreamy dresses. To have one of these dresses I would need to order it without being able to see it or try it on beforehand…scary. I was fixated on these Quinceañera dresses, so I decided to order one sight unseen. It could always be altered if it didn’t fit. We would be travelling around Alaska all summer and I wouldn’t get to see this dress until two weeks before the wedding. Also, no returns are allowed on these dresses. This was a risky purchase. 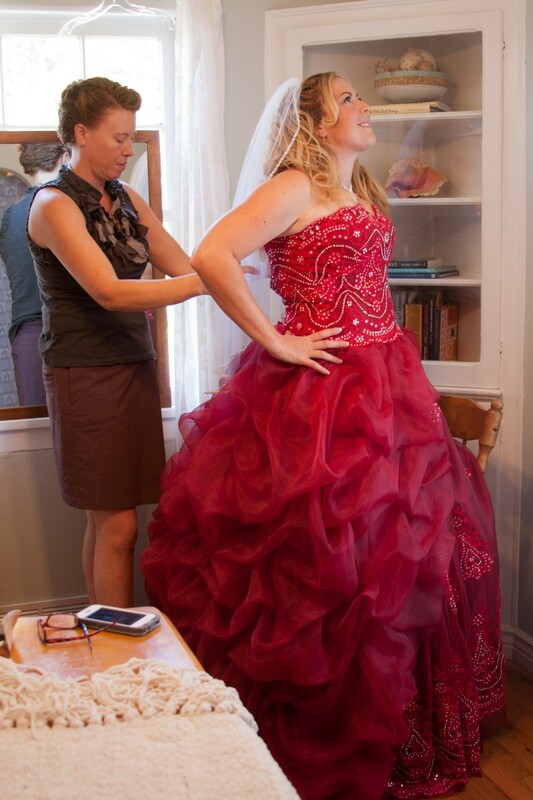 Feeling nervous, I placed an order for my dream dress – a red, strapless ball gown. I waited in suspense for my arrival back in the lower 48 to try on the dress on for the first time. Thankfully, it worked out. The dress was gorgeous, very well made, and fit well. It needed just one simple alteration – the installation of an eye hook at the bottom of the corset in the back. I was so relieved! The moment I put it on, I felt excited. All the waiting and risking had been worth it for the opportunity to wear this dreamy dress. 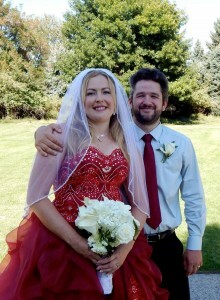 When the big day came, the dress felt really luxurious as it rustled in huge folds around my body. It was incredibly fun to wear! My little four year old niece and flower girl loved twirling herself into the huge folds of the skirt, and I loved the feeling of being surrounded by all that fabric. I felt confident and energized while wearing all that red. The dress seemed to somehow transfer its passionate hues to its wearer, making me feel even bolder than usual. 1. Don’t tell too many people beforehand about your dress. Once you start telling people the word will spread quickly. Only your close friends will ask about your dress anyway, others will just assume it will be white or ivory. 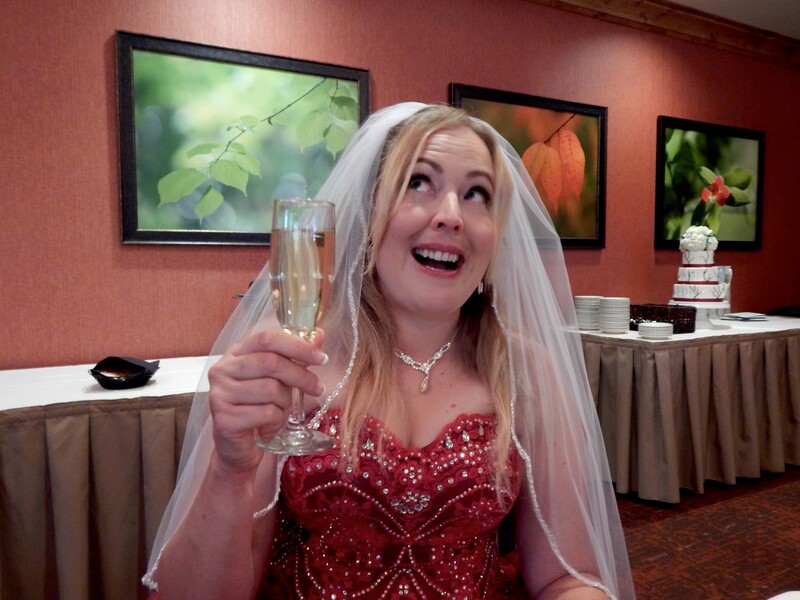 I found the surprise factor to be a lot of fun when I appeared at the wedding wearing, surprise, red! 2. If you can’t find your dress locally, at least try on a similar style to see if it works for you. 3. Pick the right color for you. A big dress in a bright color requires a big personality to pull off. Ask a friend to help you choose a color that suits your personality and looks great on you. 4. 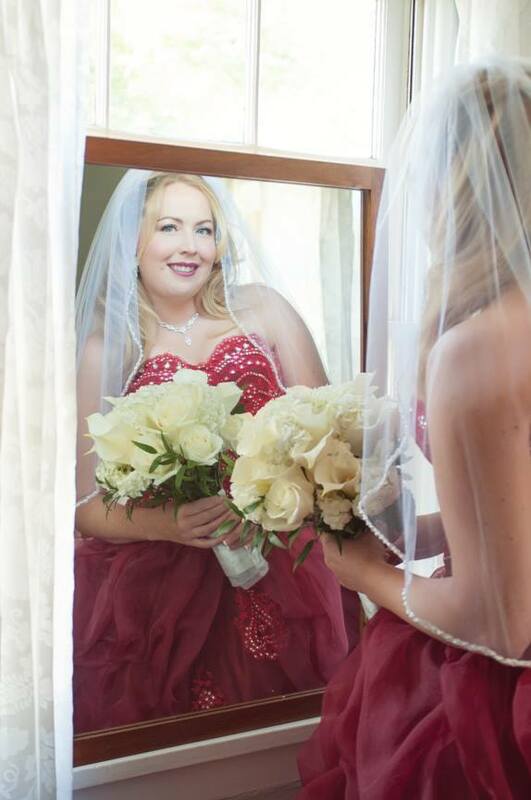 If your dress has a corset, ask a friend to go with you to pick up the gown so they know how to lace the corset on the big day. 5. Get a dress that’s well made. The non-traditional look is easier to pull off when your dress is top quality. 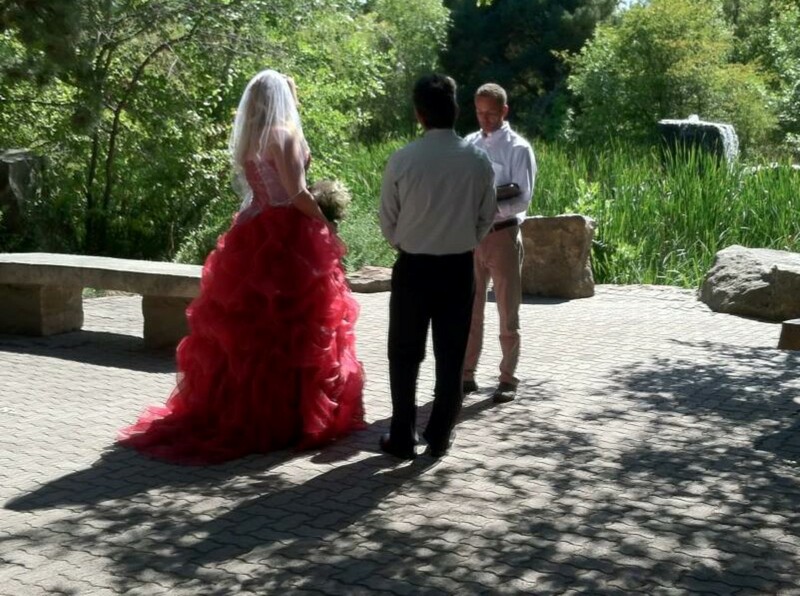 My dress was made by a company called Quinceañera Collection and it weighed a full eight pounds. I was really impressed with the fabric, construction and details of my dress. 6. Just do it! If you want a wedding dress that is bold and beautiful, honor yourself by wearing that dress which sings a song only you can hear. You’ll be glad you did.